As much as we LOVE spending time with our girls on this Grace-Filled Journey, sometimes, Kyle and I need a little time for ourselves. 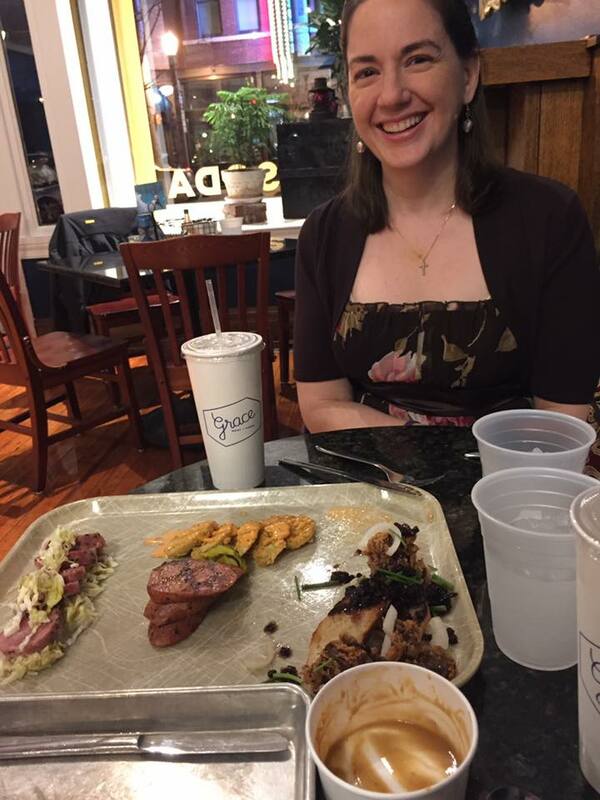 Sometimes, those "dates" come in the form of a dinner or game to cover for the paper. Sometimes, those "dates" are a chance to work on the house without interruption. 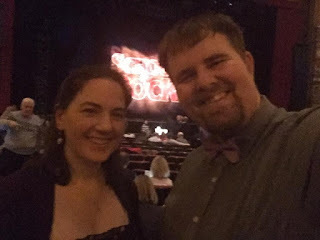 But every once in awhile, those "dates" come in the form of dinner and a trip to the Fox Theatre in St. Louis. Food selfies . . . This past weekend was just one of those chances. 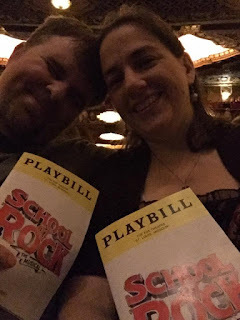 My mom and dad had bought Kyle tickets to see School of Rock at the Fox on Friday night, and we decided to try an up-and-coming new restaurant in St. Louis before the show. 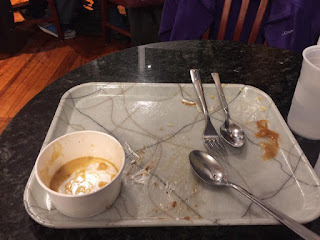 Let's just say dessert was delicious . 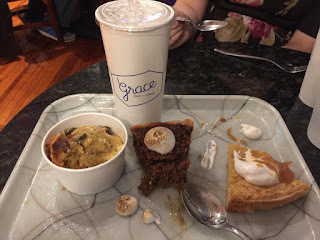 . .
Before one of Grace's doctor's appointments in St. Louis, Kyle found a restaurant called Grace Meat + Three, and we were immediately drawn to it because of its name. Kyle reached out to the owner on Twitter (because he's a whiz at social media), and Rick Lewis said he couldn't wait to meet Grace. We didn't end up getting to go after Grace's doctor's appointment, but it's been on our list ever since. 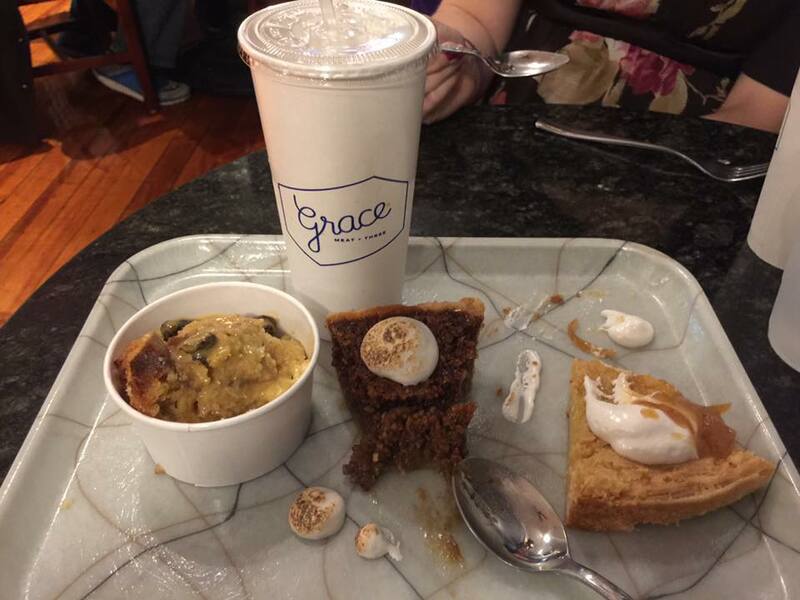 We can't wait to try Grace Meat + Three again! 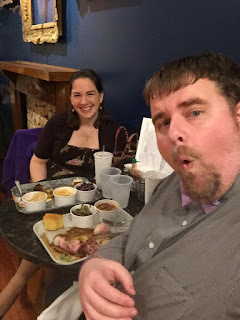 It was awesome to have a chance to meet Rick when we visited Grace Meat + Three that night, and we enjoyed the relaxed and family-friendly atmosphere of the restaurant. But the food was simply unbelievable. I think we tried just about everything on the menu, and can't wait to go back sometime soon! 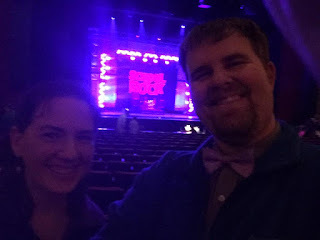 After finishing our yummy desserts, we headed to the Fox for an absolutely fabulous and funny show, based on the movie with Jack Black. The Fox is always a wonderful time, and I'm so grateful Kyle is always willing to see just about anything with me. We spent the show laughing and holding hands, and just generally enjoying each other's company. For one night, it was a chance to escape all our newspaper and parenting duties and just be Kyle and Mary. Time for School of Rock! 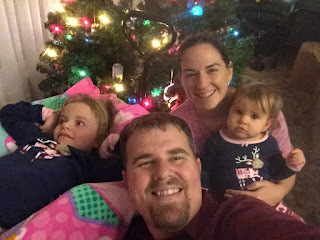 While we were gone, Grace and Charlotte had a pajama party with grandma and grandpa, and one of the best parts of our date was getting to sleep in the next morning! We LOVE the Fox Theatre! I read somewhere once that the divorce rate in special needs families is one in every two marriages. That seemed high to me, but the stress of raising special needs children certainly adds challenges to any relationship. Kyle and I probably argue more often than we care to admit, but we continue to love each other and our family. That's why it's so very important to make time to spend together every so often, without the kids, without the work, and just enjoy what truly made you fall in love to being with. Our Grace-Filled Journey is certainly never something I imagined when I pictured my perfect fairy tale story, but I'm truly grateful to have Kyle along for the ride. And I can't wait for our next date night! At the close of each year, I always find myself inspired to start fresh in the new year. It seems like the top of my list remains the same year to year, with things like losing weight, keeping in better touch with friends and family and spending more time with my daughters. When I look back through the year each December, sometimes I've done better than others, but I always remain inspired that the next year will be better than the one before. Although I have to admit the last one was hard to beat, as we added Charlotte Grace to our family. This year, as I was thinking about my column, I decided I would spend the year writing about people that inspire me. Maybe they inspire me to work harder or be a better community member. Some have inspired me to love more and remember that our time on this earth is often more fleeting than we think. But they all inspire me to be a better person, and I hope they inspire you too. It seems only fitting that the first person I write about is the one person who inspires me most of all every single day, my daughter, Grace. In her six short years, she has taught me more about love, compassion and acceptance than I had learned in my previous 31 years. 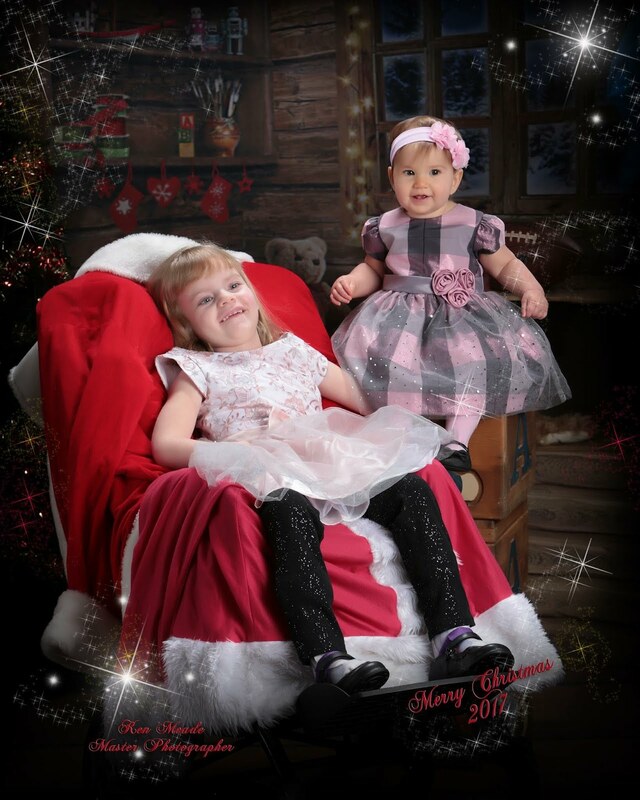 Before she was officially diagnosed with INAD (infantile neuroaxonal dystrophy), Grace showed signs of developmental delay. And being the diligent parents that we try to be, we had her in physical, speech and occupational therapy through Early Intervention and physical therapy both in town and in Springfield. We made Grace work hard. 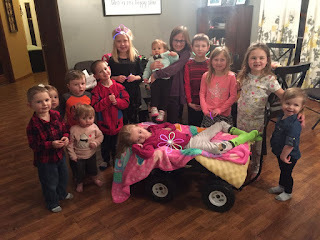 At the time, we thought Grace would eventually catch up to other kids her age, so we pushed her. And she rarely complained. Although she did have some tears in physical therapy at times, she always kept going. I don't think she was ever in pain from the therapy, I think it was just a struggle for her sometimes. 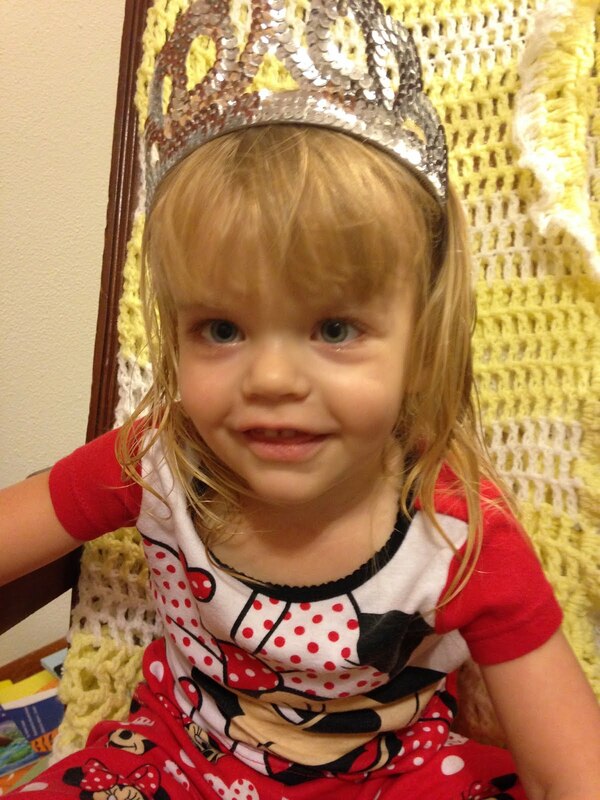 She's now six-and-a-half-years old and has been in physical therapy alone since before she was two. That's a lot of hours and hard work logged, but she always has one of her winning smiles for her therapists. Despite all the basic skills INAD has stolen from her, Grace is almost never without her signature smile. And what an inspiration that is to me. Some days, I would rather stay in my pajamas, pull the covers back up over my head and not get up, especially not with a cheery attitude. Life is hard. And it's not fair. And it would be easy to mope about the hand we have been dealt to play. 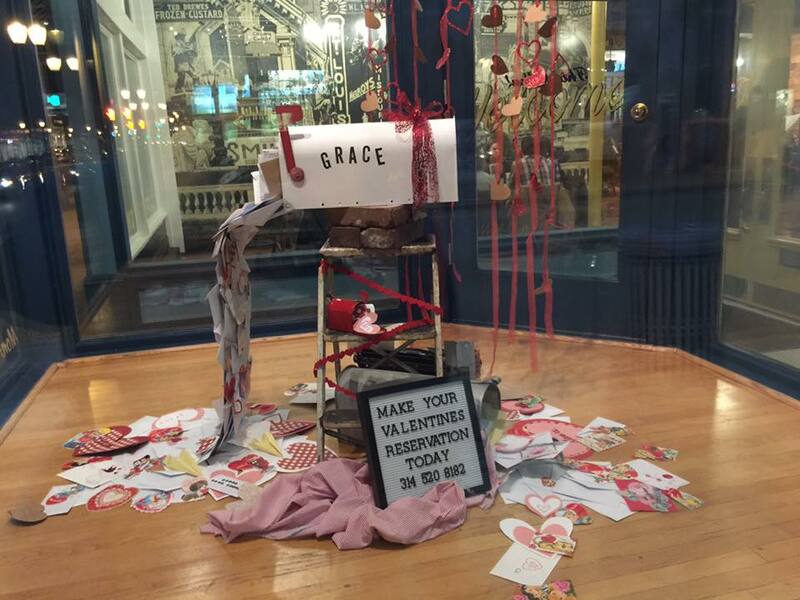 But Grace is an inspiration. She doesn't let the hand she's been dealt affect her smile. She gets up every day, ready to meet life's challenges in a way only she can. And my goal is to meet each and every day that same way. I'm only human, so I'm pretty sure there will be moments I come up short (just ask Kyle or my mom), but life is about persevering through its challenges. Grace teaches me that, every single minute I'm with her. And I'm a better person for it. But the best part is that Grace doesn't just inspire me to meet life's challenges head on, she also inspires others to be kind and loving, just by being herself. 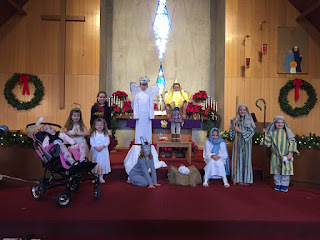 When we sent Grace to preschool four years ago (before we knew about INAD), I was worried Grace would be treated differently because she doesn't have the same skills other preschoolers have. 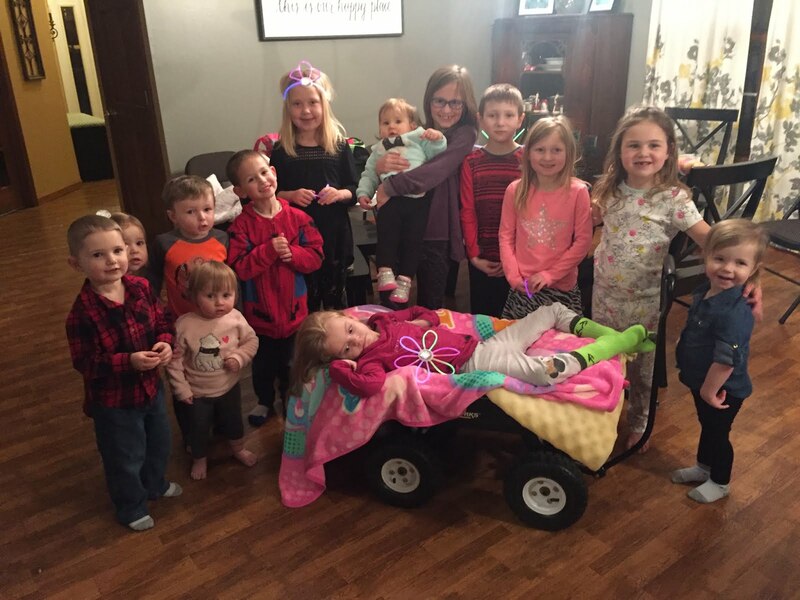 Imagine my surprise to find just how much the kids embraced her. Every day I brought her to school, the kids in her class met me at the door, excited to see Grace. And they still do. Grace was a "caught with character" winner in her kindergarten class this year, and the other students in her class were so happy for her. And I know they miss her when she's not at school. Those kids inspire me too. They don't look at Grace as different than they are. They simply accept her for who she is, and love her just that way. The world could certainly use a few more kindergarten thinkers. I'm excited to share stories of some very local people who truly shape my life through their words and actions, their love and compassion. And I hope you'll be inspired too. After all, there's a lot of reasons to be grateful on this Grace-Filled Journey. 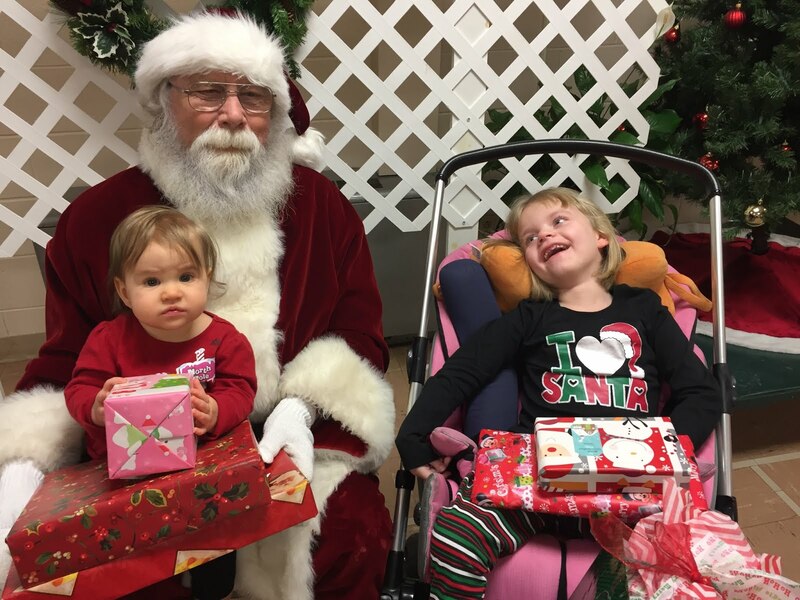 Ever since we first found out that Grace had infantile neuroaxonal dystrophy, we have dedicated as much time as we can to give our little girl as many awesome life experiences as possible. As the calendar flipped over to 2018, we are already off an running with that mission. While we aren't the biggest hockey fans on the planet, going to a St. Louis Blues game has been on our short list of Grace experiences for some time. I don't really follow the Blues, but a number of my friends do and I'm always intrigued by the passion that they have for their team. 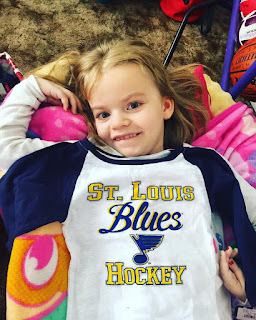 Grace was all ready for her first Blues game with a new shirt! For one reason or another, we've never made it to the Scottrade Center to catch a game in person. We've been able to take Grace to several St. Louis Cardinal games, college football and basketball games and other memorable events, but the Blues' scheduled hadn't meshed with ours yet. 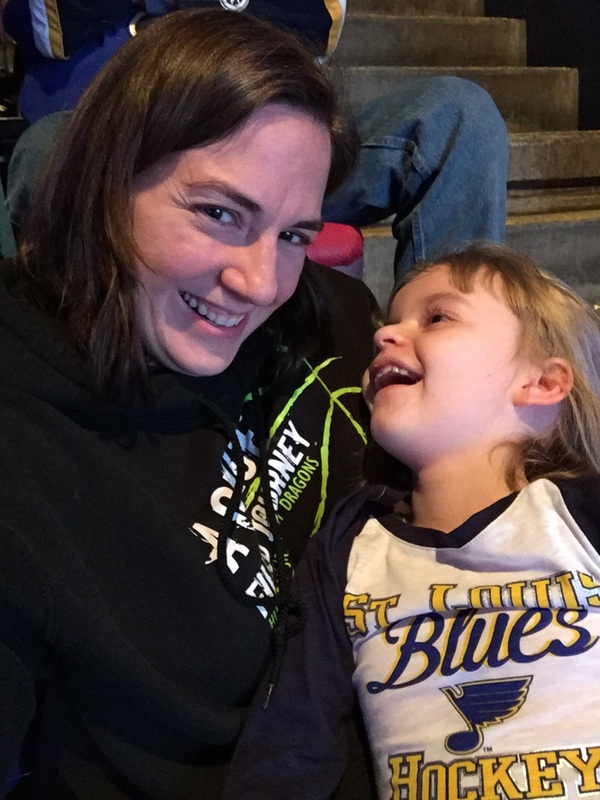 That streak came to an end on Tuesday, Jan. 2, when we finally made it to see the Blues take on the New Jersey Devils. The tickets were actually a gift from my siblings, who knew that we wanted to make it to a game. To make sure that we didn't schedule anything for that date (it happens a lot with us), my sister Mikaela told us in advance to save that day for something special. Still we had no idea what it was going to be until Christmas Day, when we opened up a present for Grace and saw three tickets to the game. As Mikaela explained, it was a nearly perfect trip for us. The Blues were playing the Devils, who I quasi-rooted for when I was a kid. I loved Martin Brodeur, who was the goalie for New Jersey and later for St. Louis. I still have the jersey, although I opted for a Grace T-shirt for the game instead so not to draw the ire of the St. Louis faithful. Family photo after the game! The game was also Mizzou Night, a special theme night where the Blues gave away soccer-style scarves with the Blues and Mizzouri Tigers logo on them, along with the letters M-I-Z B-L-U, a play on Mizzou's rallying cry. With Mary's love of all things Mizzou and my collection of soccer scarves, it was a perfect fit for us. We anxiously waited for the day of the game and headed for St. Louis with the girls after Mary and I got off work. In retrospect, we should have probably left a little sooner, but we're newbies at this so we ran into a little bit of traffic. Or at least I think it was traffic. I've been in parking lots that moved faster. 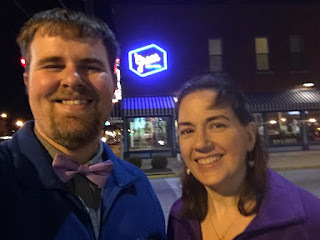 After a slight delay, we parked in a garage down the street from the Scottrade Center and walked as quickly as we could in the frigid temperatures. Hanging out with Charley in the second period. Charley wasn't as excited as me about the new Mizzou scarf! Once we got in, we went to get our scarves and find our seats. They were absolutely perfect. Mikaela had contacted the Blues to try to find a good fit for our family and came up huge. 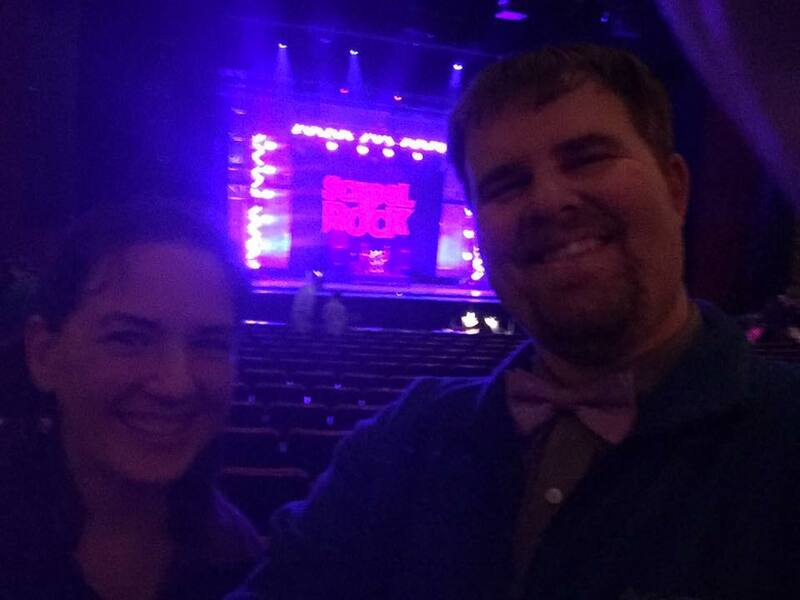 We were in the third row of the upper deck, with no stairs to go up or down. Our usher helped us store Grace's stroller in the handicap accessible section, which was right next to our seats. 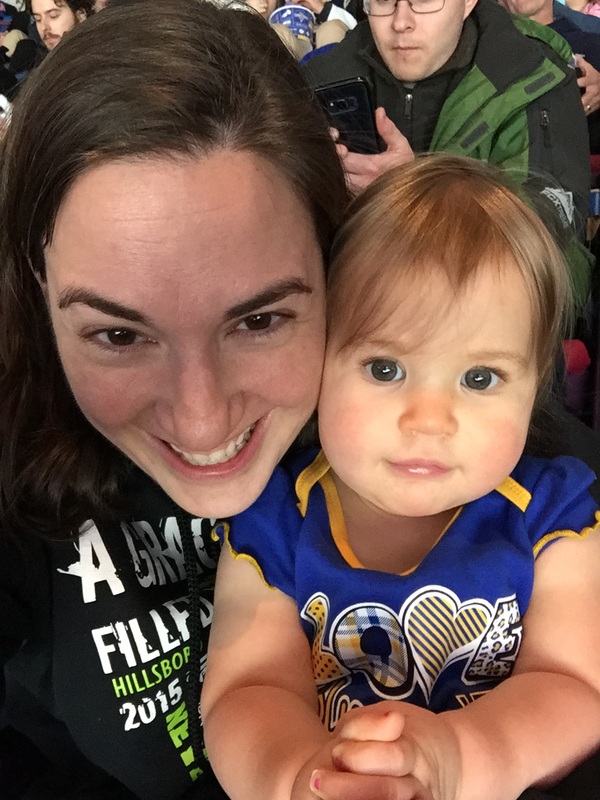 As we settled into our seats, me holding Grace and Mary holding Charlotte, I was immediately struck by the atmosphere of the game. It was just about to start the second period (yeah, we should have left earlier) and the sounds and sights were amazing. With music and horns blaring, the Blues skated onto brilliant white ice that seemed to illuminate the whole arena. Grace has always loved loud noises and bright lights and she smiled often as the game restarted. The only thing better than watching Grace's reaction was watching Charley's. 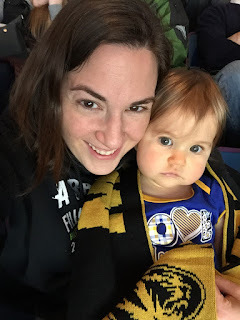 She's one of the most expressive little girls I've ever seen and at 10 months old, a professional hockey game was almost too much for her to stand. She bounced. She smiled. She yelled in joy. It was infectious. It brought a smile to my face and Mary's immediately and to many others sitting around us, including the gentleman sitting next to Charley that she befriended immediately. Grace was all smiles for most of the game, taking in all the sights and sounds. As the game went on, it just got better. We had nachos and Mary fed Grace her dinner (unfortunately Pediasure doesn't make a nacho flavored shake, or perhaps fortunately). I got the chance to hold Charley, which was quite a work out, but a really fun one. The game itself had a little bit of everything, with the Blues coming away with the win in a shootout. Even hockey novices like Mary and I were in awe of some of the things that happened on the ice, particularly Blues' goalie Carter Hutton almost single handedly willing his team to overtime, then a victory. After the game we made the run back to the van and got the girls in their pajamas for the hour drive home. Charley, who remained her happy, bouncy self for the entire game, fell asleep immediately, while Grace dozed a little, but stayed awake. I know that Grace only understands a little bit of what goes on around her, but I'd like to think that she was just too excited to sleep on the way home. While it's taken us a long time to make it to a Blues game, it won't be our last. 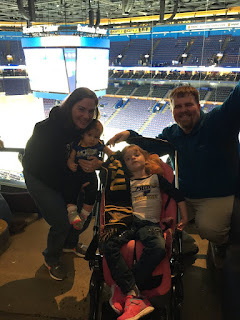 I'm not sure we will ever be the biggest hockey fans in the area, although I can't speak for Charley, but the atmosphere and kindness of those we encountered at the game will bring us back someday for sure. As they say at the Scottrade Center, "Let's Go Blues!" It seems hard to believe that it's already time to turn the calendar over to another new year. But even though I put the 2017 calendar in the trash can, it was a great chance to reflect on the joys of the past year, especially the holiday season. Every year after Thanksgiving, I tell myself that I am not going to get stressed out about the holidays. And every year that's something I fail at. This year was no different. Matching family Christmas pajamas this year. We were blessed to celebrate Thanksgiving with both of our families, since both sets live in Montgomery County. It's always so nice to share meals and enjoy being together. But it wasn't long after that my panic started to set in. For some reason, the holidays, Christmas in particular, tend to be very hard for me. Though I love to give gifts and I LOVE to shop, it's hard to walk past aisles of Barbies, games and puzzles and not be able to put it all under the tree for Grace. Meeting Santa at the Hutson Christmas. And I begin to let some sadness about INAD creep into my heart. I wish Grace could be excited for Santa and create a list of things she would love to find under her Christmas tree. I would love to hear her sing some of my favorite Christmas songs. This year, "All I Want for Christmas Is My Two Front Teeth" would have been most appropriate. But most of all, the sadness creeps in not knowing how many Christmases I have left to celebrate with her. Some days, it takes all I have to go to family Christmas events with a smile, wishing in my heart things were different. Grace was an angel in the church's Christmas program. Lighting the Advent candle at church. 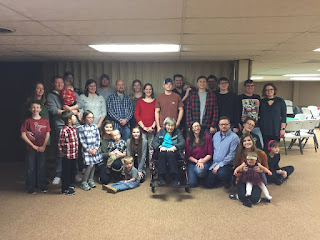 But despite some sadness on my part, we generally had a great time celebrating with extended family in the days and weeks leading up to Christmas, and then with our immediate family during Christmas Eve and Christmas Day. I loved watching Charley interact with her cousins, though I'm pretty sure she will be trying to boss them all around by next Christmas. Our Minion gingerbread house looks almost good enough to eat! Kyle and I built our traditional gingerbread house with the girls at home. This year's theme was Minions, and it was tough to keep Charley from putting all the small decorations in her mouth. It's honestly hard to keep Charley out of most things. Decorating the tree with our favorite girls. 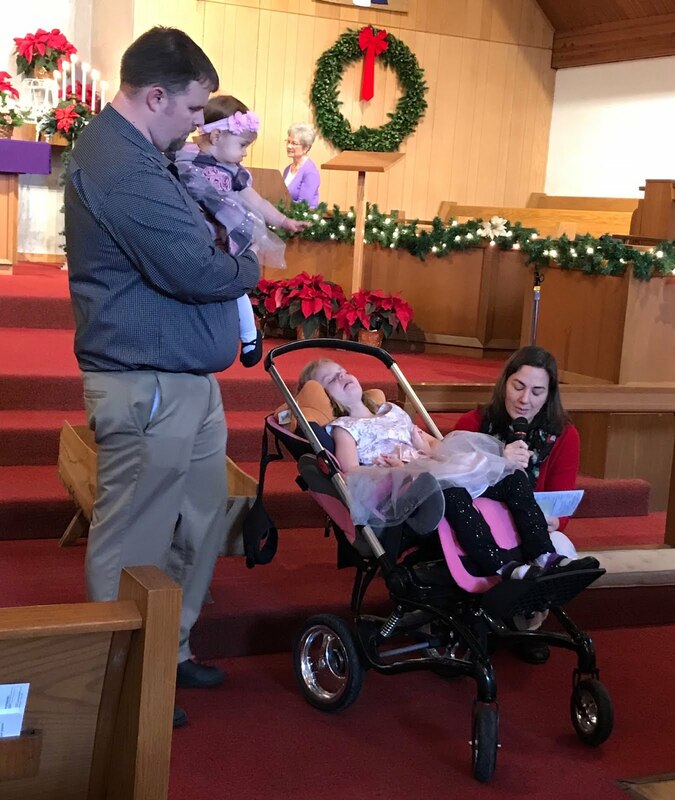 One of my favorite moments this Christmas season was lighting the Advent candle with my Kyle, Grace and Charley at church on the morning of Christmas Eve. 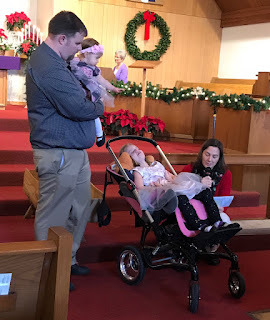 Grace and I read the prayer and scripture together and Kyle and Charley did their best not to set the church on fire, which is always a blessing. Christmas with the Armour cousins and Grandma Virginia. But it was after church for the second time on Christmas Eve that my heart finally found its happiness. After checking out some Christmas lights and luminaries, we headed home to open presents with the girls. And we managed to catch the last hour of "It's a Wonderful Life." It's always one of my favorite Christmas movies, and I can't help but tear up every time Harry Bailey toasts his brother, George, "the richest man in Bedford Falls." The girls Christmas portrait from our friend, Ken Meade. As I snuggled Charley sound asleep in my lap, I realized that we really do have a pretty wonderful life. If I could make Grace better, I would do it in a heartbeat, no matter the cost. But the long and short of it is, that I can't. I can't change the fact that Grace has INAD, or that it's devastating the way it steals everything from her little body. Christmas with the Galer family. Christmas with the Herschelman family. But here's what I can do. I can change my attitude about it. Most of the time, Kyle and I do keep a pretty positive outlook on our situation, but every so often that sadness creeps in and tries to steal my joy, especially around the holidays. For me, the best thing is just to keep going. Just to attend family Christmas events, take Grace and Charley to see Santa (even if Grace doesn't understand), build a gingerbread house, even if Grace can't help. And genuinely live our lives as if everything was normal. Sometimes we have to modify our events so that Grace can be part of it, but I wouldn't have that any other way. Ringing in the new year with these cute kiddos! This year, we had the opportunity to ring in the new year with five other families and a total of 13 children. Yes, the adults found out we were outnumbered this year, and we blame Charley. But together we celebrated all the things that are good about life, friendship and family. And when you have so many things to be grateful for, it really is a pretty wonderful life.